Home » Last Days , Obedience to God , Persecution , Sifting , Ten Commandments » On Whose Side Will You Stand? On Whose Side Will You Stand? 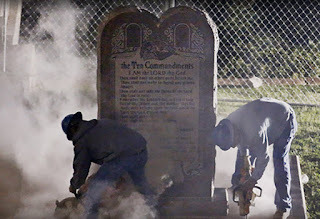 Workers Remove Ten Commandments, Ok.
"Across America, people of faith are under attack, as judges, politicians, activists, and anti-God groups assault our faith and lead our nation toward moral collapse. This vocal and well-organized minority are out to remove Christianity from the public square—and we have little reason to believe they'll stop there. "What we see happening today many will just ignore, but I cannot. A spiritual war of colossal significance is on the rise. 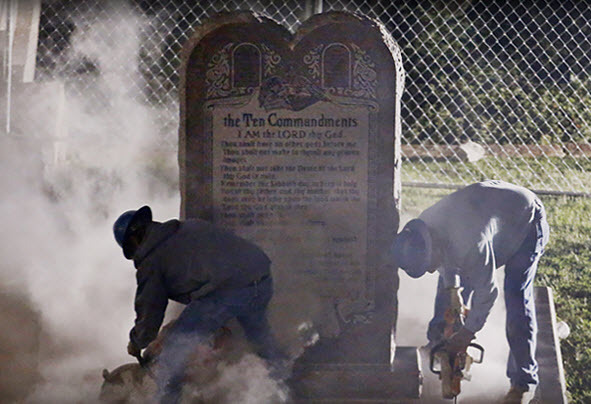 Recent movements bent on destroying or crippling the Christian faith have thrust believers headlong into the public eye where a battle to defend our most cherished beliefs is being waged. A divisive “culture creep” is slithering into our sanctuaries causing infighting—Christians battling Christians—over foundational biblical truths, life issues, homosexuality, and traditional marriage. Issues like these and others are very harmful to the cause of Christ and result in deep divides in cooperation and fellowship; but it doesn’t end there. It also seems Christians who hold to the foundational teachings of Scripture are being lambasted on political, educational, scientific, and social levels like never before. I wondered what in the world is going on. How was God going to use this? Death and life are set before you. Be wise, choose life!